I designed this miniature tablecloth in 2000 at a friend’s request. Joan, a friend from the Knitlist, told me that her daughter Andrea (age 17) had been diagnosed with leukemia. Joan bought a miniature house, hoping that it would take Andrea’s mind off her declining health and asked me to design a lace Shabbat tablecloth. I’ve included a link to the pattern below. I don’t often name my designs but I called this one “Andrea” in her memory (z”l). Thread: DMC Broder Machine 50. Grid size is 2mm or ten dots per inch. 30 pairs of bobbins. Click the thumbnail below to open the image in your browser or right-click and save to your hard drive. 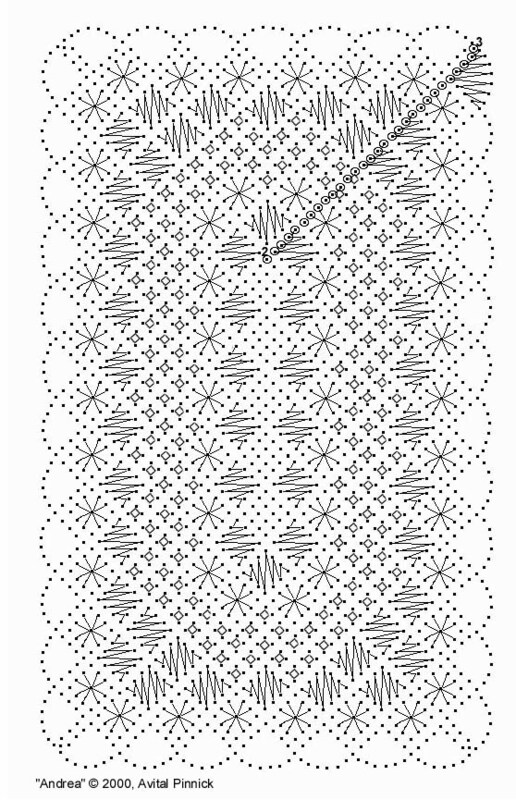 This pattern is only the pricking. There are no instructions because it presumes that you know the basics of how to hang pairs of bobbins and work Torchon lace stitches. Finished size is 8 x 5.75. Ten dots to the inch, measured along the diagonal. 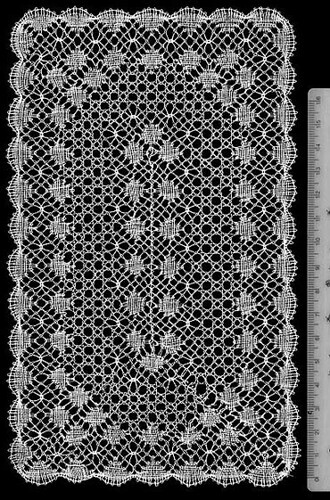 Because I did not create this design with lace design software, the grid might be slightly wonky, so check with a ruler if you suspect that something needs to be straightened. Hang the bobbins on the marked pins and work straight down. After turning two corners, work up the second side, sewing into the center edge. Shortly after Tess made her video, David Collyer, an Australian Arachne member (and a very fine lacemaker and musician), published his video on leaf tallies. David’s Tønder lace is amazing. Below is a photo of an edging in progress. I think it’s also pinned to his lace pillow in the video. Here’s another video in Italian by Francesca, a Cantu lacemaker. Now about those hundreds of bobbins — although it looks very intimidating when the bobbins are fanned out, the lacemaker is not working with all of them simultaneously! The hands only handle two pairs (four bobbins) at a time, crossing and twisting the pairs. The rest are kept in waiting, often coralled with stitch holders or homemade bobbin holders. Beginners usually start with a simple pattern like cloth stitch, worked with 6 or 8 pairs, then progress to a bookmark or narrow edging. 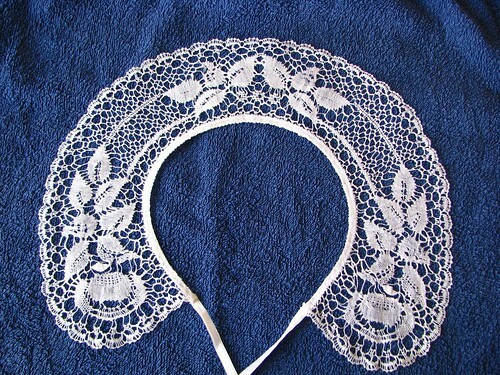 Bobbin lace collar, “Johannan Ruusu,”, from Roses in Bobbin Lace, by Eeva-Liisa Kortelahti. I worked it in linen thread, Bockens 90/2, probably around 1998. Wish I’d kept records! You’ve been bitten by the bobbin lace bug? You want to start but aren’t sure how? My first piece of advice is to buy good materials from the start. Stay far, far away from the Bobbin Lace Kit sold by Lacis, Joanne’s, and a few other places. It’s cheap but the materials are of such low quality that they are frustrating to work with and they’ll never be used again. Get your materials from The Lacemaker, Snowgoose, or Helen van Sciver. These merchants (who are not paying me to say nice things about them) will give you personalized attention. Their supplies are excellent quality and often you can call them and ask them to put together a kit for you, based on the kind of lace you want to make (if you already know), your budget, and needs. It does cost more than knitting or crochet or tatting (it’s also a lot more demanding, which is probably one of the reasons that it’s not a widespread hobby these days). 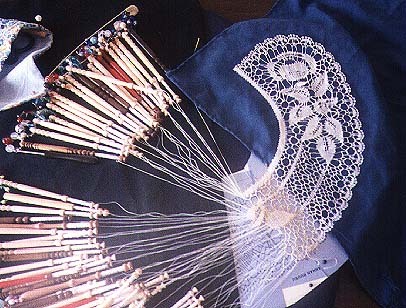 On the other hand, if you decide that bobbin lace isn’t for you, the supplies can easily be sold on eBay. Also, most of the initial cost is up-front. Once you have a pillow, pins, bobbins, and patterns, the cost of thread is minimal. I recommend starting with Torchon because it is straightforward, logical, and not too fiddly. No leaf tallies! It works up fairly quickly and looks quite handsome in fine or coarse threads. The Torchon Lace Workbook Bridget M. Cook. Very nice designs in this one! I haven’t done bobbin lace in ages, but I wanted to mention Tess’s video on making leaf tallies. These things are tricky! I know Tess from the Arachne lace list, which I moderate. 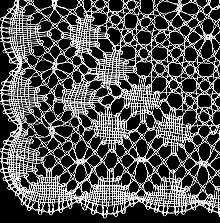 I don’t use this method but I’m posting it because good videos on bobbin lace technique are not very common. The trick is to get fat, nicely rounded leaves with smooth edges — not “holly” leaves! 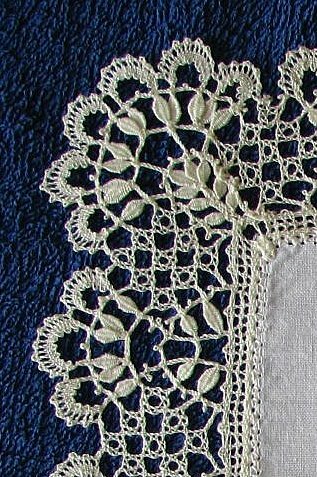 I started this Cluny lace edging in December, 1998, for a bobbin lace demonstration/lecture that I gave at the Dec. 31 meeting of the Jerusalem Fiber Craftsmen, at the Israel Museum, Jerusalem. 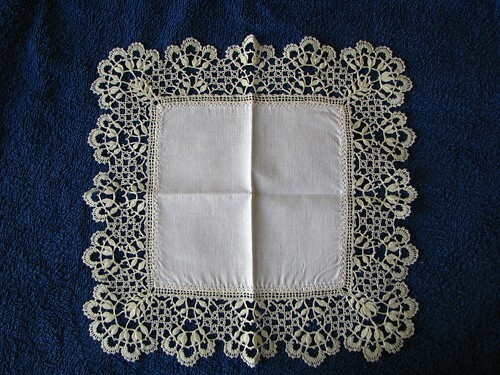 The pattern is from Pamela Nottingham, Bobbin Lace Making, worked in Bockens 50/2 linen. It was completed in February 1999. When I started this edging, I had no idea that it would eventually have over 200 leaf tallies. I also didn’t realise how difficult it would be to keep talking during the lecture while working a leaf tally, which depends on such careful tensioning of the bobbins. I drew threads from the edges of a piece of linen and triangle pin-stitched (not to be confused with the embroidery stitch of the same name) the edging to the fabric center. UPDATE: Just found out about Jean Leader’s excellent drawings of a leaf tally. She also has a video, which is very clear.